Make sure you don't miss any of our great deals, plus the latest anime news, new release info, and lots of other cool stuff! Got some Anime you no longer want? Trade in your Anime DVD's, CD's, or Manga for store credit towards your next order! It's quick and easy! Have an Anime website? Join our affiliates program and earn credit towards free Anime! In 2001 Robert lost both of his parents to Cancer, and we are making this link available to anyone who wishes to contribute to help our fight towards a cure! We can win! Here at RACS we love our four legged friends, and we support organizations that give care, shelter, and help prevent cruelty to animals. Give a little and make a big difference! Where are we in the real world you ask? WE ARE DEDICATED TO ANIME FANS JUST LIKE YOU! The Anime Corner is your original Anime Super Store online! Since 1997 we've been helping Anime fans build their collections from our selection of over 16,000 anime items that we keep in stock at our own fulfillment center in Winchester, VA. We offer great customer service, fast shipping, and everyday low prices. No clubs to join and no gimmicks to sift though - just a source you can trust for all of your anime needs. Our mission is to be your best source for Anime online! boxed set before it's gone! Order Your Copy Today! Featured - HERE COMES AN AVALANCHE OF SAVINGS @ RACS! 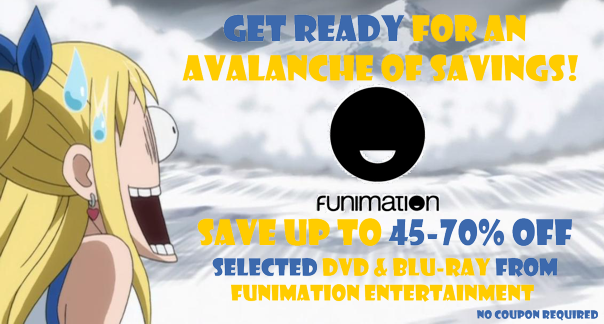 Save 45% to 70% Off selected Anime from Funimation Entertainment! OTHER CURRENT LIMITED TIME OFFERS @ RACS! Figurines, Soundtracks and Merchandise Discounts Already Reflected in Product Price. After two demon girls, Maria the succubus and Mio the demoness, force Basara into a contract that makes him their master, the trio form a complicated master-servant relationship. A mysterious black cloud kicks Haruyuki and his friends out of the online fighting game Brain Burst. Unable to reenter, they discover that this isn�t just an isolated incident..
For the first time ever, experience the wonder and beauty of the Mamoru Hosoda film collection. Set includes: The Girl Who Leapt Through Time, Wolf Children, Summer Wars, and The Boy and the Beast. Heaven decides that it's time to start looking for a new savior to keep humanity from succumbing to the lure of Sin. From acclaimed mangaka Tsutomu Nihei, the creator and artist behind BLAME! and Knights of Sidonia, comes his newest science-fiction epic. The prestigious Dahlia Academy educates the elite of society from two countries: to the East is the Nation of Touwa; across the sea, the Principality of West. Coyote, a werewolf, goes through life hiding his true identity. But when a handsome human pianist catches him in heat, forbidden passion explodes. Coyote avoids humans in order to conceal the fact that he�s a werewolf. Writing light novels isn't all that easy, especially when you're in high school and you have to do the cooking and the chores for your shut-in stepsister who's hardly come out of her room the past year! This figure of the brigadier general from the browser/mobile game stands nearly 10" tall. One of the younger members of the Flower Division, Ms. Shinguji appears here in an out of this world pose as she dances in the wind. There may not be anything better than enjoying an evening with your favorite soft Anime plush toy! Reveal your inner Otaku by decorating your room or dorm with your favorite Anime characters! The only thing better than watching Anime is wearing your favorite series for all your friends to see! TRADE IN YOUR STUFF: OUT WITH THE OLD - IN WITH THE NEW! Did you know that you can trade in your previously viewed DVD's, BD's, CD's, Manga, and Video Games for store credit? Trading in your excellent condition previously owned stuff for credit is now very easy, and we've even expanded the program for some non-Anime items too! Just click on this link to see the trade in values of your used stuff, then pack-up your items and send them to us - there is no need to contact us first or obtain an authorization number. Once they arrive and are inspected, we'll e-mail you with a special credit code you can spend on our store. It's that easy! So why just let your stuff collect dust? Trade it in and get something you really want! DON'T MISS ALL THE ACTION - SUBSCRIBE TO ROBERT's e-NEWSLETTER! Every Friday afternoon we send out our comprehensive e-newsletter to the entire Anime Corner family outlining all the latest arrivals, newest offers, and (of course) Robert's musings on what's going on in the Anime world. Best yet, it's completely free. So what are you waiting for? Over 41,000 other otaku can't be wrong! Subscribing will only take a minute and will ensure you will be privy to all our latest arrivals and exclusive offers. So sign up and become part of the Anime Corner family - Noemi welcomes you! At the Anime Corner Store you'll find all things Anime, including all North American released (and licensed) Anime DVD's, Manga, Soundtracks, Toys, Apparel, Books, Cels, and much more! All your favorite Anime DVD's, and CD's are priced at an everyday 20-40% discount off retail, and you'll find even better prices on bundles & boxed sets. With great everyday prices + excellent selection on Manga and lots of other Anime items, ultra fast shipping on all domestic orders, and convenient online secure ordering you can make the Anime Corner Store your source for all of your anime needs! ...we really are the original Anime Superstore online! And, of course, you'll always be dealing with my team & I (I'm the 'Robert' in Robert's Anime Corner), not some huge mindless company who thinks of you as an order number and has never even heard the word 'Otaku'. Enjoy your shopping experience, and if you have any questions, just let us know! This is your Anime store, and we are here to serve you!